We’ve noticed that people who offer writing services like copywriting, content marketing, ghost writing, and more seem to share some common challenges. 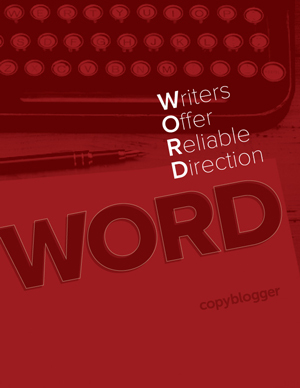 At Copyblogger, we get it: we’ve helped writers make the most of their careers since 2006. In WORD, we’re sharing our best advice from respected professional writers like Sonia Simone and Brian Clark. Just add your email address below, click the confirmation link we’ll send you, and you’ll get instant access to WORD from Copyblogger.